More than a year and half after it was first teased by Nintendo, Animal Crossing: Pocket Camp is coming to mobile devices. And thanks to a 13-minute-long Nintendo Direct presentation exclusively about the new free-to-play game, we finally know how it will play, too. You can watch the digest version below and scroll on for the details. What do you do in Animal Crossing: Pocket Camp? Your basic routine in Animal Crossing: Pocket Camp is pretty much the same as in previous Animal Crossing games: you wander around various natural areas, making friends with anthropomorphic animals and gathering natural goods like fruit and fish. The map is split into multiple themed areas rather than being one big, contiguous village now: you can drive your camper over to Breezy Hollow to shake some apple trees, then head down to the beach to collect sea shells and fish. Your villager takes on the role of camp manager, which - yes - is basically wilderness mayor. Instead of issuing edicts that help govern how the town works, you'll decide how to build up your camp to appeal to different animals. The game also codifies and streamlines certain parts of the Animal Crossing experience; for instance, you now have set "Friendship Levels" with villagers that you can increase by talking to or doing favors for them. What kind of customization is in Animal Crossing: Pocket Camp? So much customization. As usual, it starts with your villager. Instead of esoterically determining your appearance through conversation with a cat, you pick options from a standard character creator (and yes, those options finally include a range of skin tones). Then you can customize the interior of your camper with furniture from the Market Place - where the Nooklings, the Able sisters, and more merchants set up shop out of trucks - or take it to the local mechanic for a new paint job or even a second story loft. That's all just for your personal life. As camp manager you can order furniture to be constructed that will draw certain animals to your camp (each animal has a favorite piece of furniture). This furniture costs resources that you can collect by doing favors for your animal friends. You can also order the construction of bigger-ticket items called amenities, which will increase your maximum friendship level with animals who are into that kind of thing. It takes a while for these to get built - in the video, the timer for building a pool was 72 hours (three days). Does Animal Crossing: Pocket Camp have microtransactions? Yep, Leaf Tickets are the microtransaction currency in this game. You can use them for all kinds of things, like supplementing your supply of resources for building furniture or speeding up the construction of amenities (bet you saw that one coming). 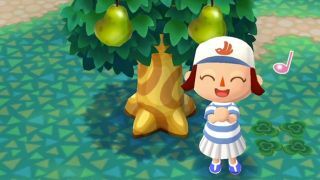 Throw Nets, which let you catch a bunch of fish at once, and honey, which does the same for bugs, are also sold in exchange for Leaf Tickets. Or you can purchase entrance to Shovel Strike Quarry, where you'll earn valuable minerals that you can sell for bells. The overall approach for Leaf Tickets seems to be "more stuff faster" rather than locking exclusive content behind them. Even if you don't want to spend any money on Animal Crossing: Pocket Camp you can still earn some Leaf Tickets by leveling up and completing certain in-game goals. Can I collect playable NES games in Animal Crossing: Pocket Camp? Haha, I wish! We'll just have to go back to the GameCube version if we want to enjoy Tennis and Balloon Fight in the comfort of our customized Animal Crossing homes again. When can I play Animal Crossing: Pocket Camp? Animal Crossing: Pocket Camp will come out worldwide in late November. It sounds like it will be a simultaneous release on iOS and Android, unlike Super Mario Run. You can sign up to be notified when the game goes live in the US and in the UK. Unless… you happen to live in Australia, or don't mind pretending. For some reason, Australians are getting the game a month early on both iOS and Android. It's not unusual for Australia or New Zealand to get early "soft launches" for apps so developers can test them out, but going out a whole month early is pretty unusual. Oh well, it's here! And you can even start playing yourself if you don't mind fibbing a bit to create an Australian account. Looking for more phone fun? Check out our list of the best iPhone games to play right now.